If you are ready to enroll your child/children in religious school, enroll now. If you need to apply for scholarship, please click here. • Regular enrollment ends July 31. 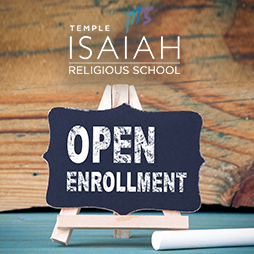 If you have questions about the enrollment process or our religious school program, please contact the Religious School office at 310.277.2661. Carla Kopf or Stephanie Schwartz will be happy to help you. Sunday 9:30 a.m. to noon or Tuesday 4:00 p.m. to 6:00 p.m.
Sunday 9:30 a.m. to noon and Tuesday 4:00 p.m. to 6:00 p.m.
One Tuesday per month, 6:00 p.m. to 8:00 p.m.